Are you a proud babywearing mama, but are noticing your favorite carrier has a dingy look? Or maybe your big investment carrier was just the victim of a bad baby mess and must be washed ASAP? Do you feel clueless when it comes to how to wash your carrier? Carriers are a great way to help a busy mama work around the house while still holding their baby, and they allow you to get out and about without carrying around a bulky stroller. The thing is, carriers can get dirty and need to be washed. Whether it’s sweat from you, or spit up from your baby, you want to keep your carrier clean. But carriers can be expensive, so you want to make sure you are cleaning it right so it’s not ruined and can still maintain its integrity under the weight of your baby. In this article, we are going to discuss how to wash different types of carriers. We will also dive into special things you should consider when washing your carrier. Not all carriers are created equally — each type comes with different bits and pieces you need to take into consideration when it comes to keeping them clean. Some carriers have buckles, for example. Others are made out of different fabrics such as silk or linen. All of these can change the way you need to wash your carrier. It’s also important to note each brand of carrier, and sometimes different carriers within a brand, will have a separate set of wash instructions. This might differ based on accessories, fabric, or the way the carrier is made. Be sure to read the instructions on your carrier before starting the wash process. A soft structured carrier is what many parents think of first when they hear the term baby-wearing. They attach with buckles and provide a soft padded band around the waist and shoulders to help keep you comfortable when carrying your baby. Many soft structured carriers can be worn with your baby on either your back or chest. Different ones also provide the ability for baby to forward face or can be made with lightweight fabrics for hot summer months. Some popular brands of soft structured carriers include the Tula, Ergo, and the Lillebaby. Just make sure the one you choose holds your baby’s hips at the correct angle to help prevent hip dysplasia. You do not need to do a complete wash of your soft structured carrier often — instead focus on spot cleaning the majority of the time. You can do this with a soft cloth, mild detergent, and warm water. For heavier cleaning, wash the carrier in cold water on the delicate cycle with a mild detergent. Air dry and make sure not to use any bleaches, fabric softeners, or detergents with brighteners (source). A wrap carrier is a long piece of fabric you fold and knot around yourself to create a pouch to hold your baby. They are versatile and allow you to hold children of any size on your chest, back, or hips. First, put your wrap in a pillowcase or lingerie bag so it will not get tangled in the machine. Your wrap can be usually be washed in cold water on the delicate cycle using a mild detergent. What material your wrap is made of will determine whether or not you need to hang dry or tumble dry the wrap — more on that below (source). A mei tai carrier is a cross between a wrap and a soft structured carrier. It has a structured pocket for your baby to sit in, but instead of straps and buckles, a mei tai has straps you wrap around you and tie to achieve your perfect fit. 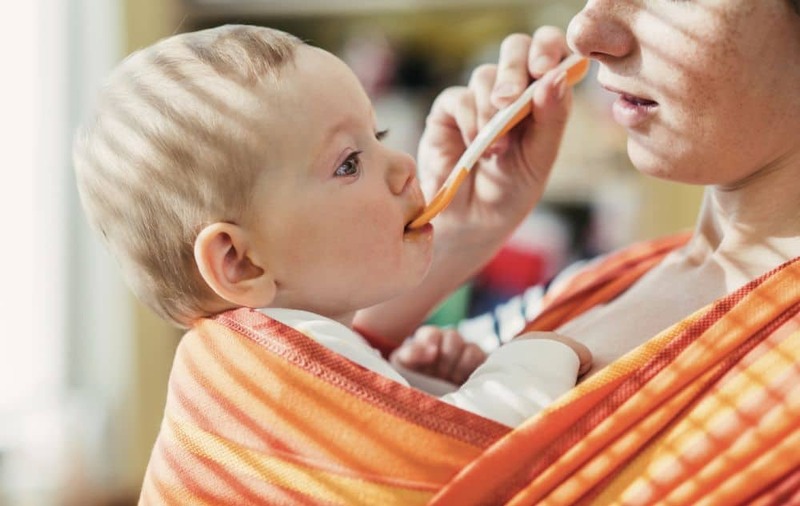 You will want to wash a mei tai in the same way you wash a wrap carrier. Place it in a pillowcase to keep it from getting tangled, then wash it on the delicate cycle with cold water and a gentle detergent. Hang it out to air dry like you would a soft structured carrier. A sling is a one-shouldered baby carrier that allows you to carry your baby either on your front or hip. The sling is kept together by two rings attached to one end of the sling. You then weave the free end of the sling through the rings to keep the carrier together. To wash a ring sling, you first unthread it from the ring so it can lay flat. Then you wash it in cold water on the delicate cycle with a small amount of gentle detergent. Allow your sling to air dry, then iron it flat to allow it to maintain its shape. What Things Should You Consider? Here are a few other things you want to take into consideration before washing your carrier. Just as you would not wash a cotton sweater and wool sweater in the same way, you also would not wash a cotton carrier and wool carrier in the same way. Here is a basic breakdown of how to wash a carrier based on what type of fabric it is made of. Blends need to be washed based on the most delicate fabric in the blend. So, for example, if your carrier is a wool/cotton blend, you will wash it based on the wool instructions. This will help you maintain the integrity of all the fabrics in the carrier. You will often find this fabric used as a blend in a wrap or sling type carrier. This fabric is super soft and should never be washed in a machine. You can instead either spot clean it with cold water as needed, have it dry cleaned, or hand wash it gently. To hand wash a cashmere blend carrier, fill a basin with cold water and a little bit of gentle detergent. Place the carrier into the water and gently swish it around for one minute, but do not scrub! Roll the carrier into a towel to gently ring out any excess water and lay it flat to dry to help it maintain its shape. It’s important to lay the carrier flat to dry because you do not need to iron a carrier made from cashmere. Wool is a delicate fabric and it can easily felt up if you are not careful. Hand wash this type of fabric in a little bit of lukewarm water with a gentle detergent (source). Make sure to keep the water at a consistent temperature, and do not twist or ring to dry — this will help you avoid felting. With bamboo viscose, you just need to make sure not to keep it in the water too long. Let it be in the water for only 40 to 50 minutes maximum, and do not rub, ring, or soak the fabric. Hang it to dry and iron it with steam to help it maintain its shape. Cotton and linen can be washed in the same manner. Wash them alone in cold water with a little bit of gentle detergent. Use the delicate cycle, then hang them to dry. You can dry this fabric in the dryer on a low setting, but remember since it’s a natural fabric it will shrink a bit. Because of this, many choose to hang dry these fabrics. Washing a silk sling or wrap will depend on how you want your sling to look. If you are wanting to maintain the shininess that silk can have, you will want to spot clean the fabric with a bit of cold water or dry clean it. If you want your carrier to have more of a matte finish, you can wash it in cold water with a gentle detergent on the delicate cycle. Add a ¼ cup of vinegar to your rinse cycle to help keep the fabric soft. Silk can shrink in the wash, so gently stretch it back to size while it is still damp to help it maintain its shape. To maintain the color and integrity of the fabric your carrier is made out of, you’ll want to use a gentle yet effective detergent. Do not use chlorine bleach, fabric softeners, or detergents that have optical brighteners mixed in. If your carrier contains silk or wool, you will also want to choose a detergent that does not contain enzymes. Drying your carrier, or any fabric, in the dryer can result in the breakdown of the fabric due to the high heat the dryer uses. Drying fabrics in the dryer can also cause them to shrink, which could ruin your carrier. Because of this, many choose to line dry their carrier. Just make sure to dry it inside and away from direct light so the colors in the fabric do not fade. Baby carriers are not exempt from getting dirty. Babies and moms spill food on them, they get spit-up on them, and they can get sweaty since babies have a tendency to be one-man heating machines. It’s important to keep your carrier clean since it literally holds your most precious possession — your baby! To review, remember to check the brand’s instruction before washing your carrier. Make sure to pay attention to the type of fabric the carrier is made out of, and the detergent you are using to wash it. Your carrier will be as good as new in no time. Do you have any tips for washing a baby carrier? We’d love to hear your experience in the comments below. And don’t keep this advice to yourself — make sure to share this article with your friends.